“There was concern before the midterms that Democrats were not doing enough to bring out voters, especially Latinos. But early indications are that Hispanic voters came out in historic numbers, and in the Southwest and parts of the West, this made a difference for Democratic candidates. Raquel Terán, a newly elected state legislator in Arizona’s District 30, said the changes are the first she’s seen of this magnitude in over a decade. “I’ve been doing this for 12 years; it’s been red, red, red. Now we are purple,” said Terán, who successfully fought off a “birther” legal attack through a subpoena challenging her citizenship status. “We are going in the right direction and what energizes me is the base; we have a solid group,” said Terán. Arizona elected Democrats to four statewide offices, U.S. Senate, Arizona secretary of state, superintendent, and corporate commissioner. Texas elected their first two Latinas in Congress, Veronica Escobar and state Sen. Sylvia Garcia. In a much-watched race for the U.S. Senate. New Mexico’s entire House delegation is now occupied by racial and ethnic minorities and the state elected its first Latina Democratic governor, Michelle Luján Grisham. Newly elected congresswoman Xochitl Torres-Small pulled out a major upset in a district that has only been in Democratic hands twice in the past 60 years. Nevada Democrat Jackie Rosen defeated Republican Sen. Dean Heller by almost 5 percent,, and the Democrats won races for governor and lieutenant governor, while also further expanding their power in the state legislature. Kate Marshall, who was elected Nevada’s lieutenant governor, has family roots in Mexico. Perhaps most symbolic, even further west Democrats turned once deep red Orange County in California blue. While groups wait for more figures on midterm voting, legislators and organizations point to several factors that helped increase Latino turnout. Early voting data showed tremendous energy among Latino voters; there was an estimated 174 percent increase in Hispanic early voting; polling showed that Latino interest in this midterm election matched Presidential year election levels. Whereas in 2014, 37 percent of registered Latinos showed interest in the election compared to previous elections, in 2018, the number increased to 55 percent. Even before the midterms, three states that had already surpassed their total 2014 votes even before Election Day — not just early votes — were Southwestern states, such as Arizona, Nevada, and Texas. In Arizona, candidates like Terán worked with organizations that represent a broad swath of the Latino community, with progressive concerns that ranged from the environment to women’s reproductive rights. Josselyn Berry is a spokesperson for ProgressNow Arizona, a coalition of organizations in the state. Berry said the coalition organizations knocked on over 1 million doors this election. “This has been a long road, the coalition of organizations, like LUCHA, Mi Familia Vota, and CASE Action have been growing and registering voters for years, this just didn’t happen overnight,” she said. Even Democrats who didn’t win in the midterms, like gubernatorial candidate David García, overcame other Democrats in the midterms largely on the energy of these groups who threw their organizing weight behind him in the primary election. Rep. Ben Ray Lujan, D-N.M., chairman of the Democratic Congressional Campaign Committee, said that the DCCC spent about $30 million to engage minority voters, including hiring minority contractors and minority businesses for their engagement strategy. In Clark County, Nevada, Democrats targeted Latino voters in part by mobilizing organizations with strong Latino membership, such as the Culinary Workers Union, which helped secure the victory of Democrat Jacky Rosen for the U.S. Senate. In Arizona, the DCCC targeted candidates in heavily Latino districts, like Democratic House candidate Ann Kirkpatrick in Pima County, adding her district to their “red to blue” list of races receiving support from the official arm of the Democrats in the U.S. House of Representatives. In California, Gil Cisneros was backed by the DCCC in deep red Orange County, California, and he recently was declared the winner in a tight congressional race, with popular writer Gustavo Arellano declaring old Orange County dead at 129 years old. Candidates like Latina Xochitl Torres Small mobilized to harness voters in a year that saw more growing dissatisfaction with the current administration, especially among Hispanic voters. But Torres Small also worked to create broader voter appeal in her traditional Republican district, including by being tough on bordersecurity and reminding voters she supports gun rights while calling for “common sense” gun safety measures. 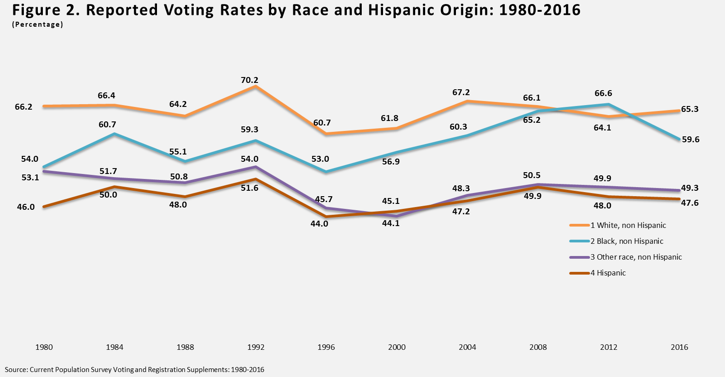 Increased turnout among Hispanics is significant considering it has remained fairly stable since the 1980s, despite a growing population. The U.S. Census Bureau has produced their Voting and Registration Supplement after every election since 1980. Latino turnout in 1980 was 46 percent, reaching a high of 52 percent in 1992, and then struggling within that range ever since. The turnout rate among Latinos in 2016 was just under 48 percent. Turnout numbers in midterm elections are lower than in presidential years for all groups and particularly Latinos who had a record low of 27 percent in 2014. Some of the reasons for lower participation rates are structural, such as barriers to participation in some states, including Voter ID laws that disproportionately impact minorities and a disregard for details, like printing out ballots with inaccurate information to constantly changing locations for voting on Election Day. When it comes to political parties, Republicans and Democrats have been criticized for not doing enough to reach out and mobilize Hispanic voters. After increased participation in the midterms, the question, especially for Democrats and progressive organizations, is whether they will continue building on the momentum ahead of 2020. Some groups say they’re ready to build on their recent political victories.